Involved in the regional tournament for TPAA were six mentors, two teacher/advisors, and 36 ninth and tenth graders. PALMDALE – The Palmdale Aerospace Academy robotics team was the top first-year team at the regional competition in Grand Terrace last week, and is now headed for next month’s world championships in St. Louis. 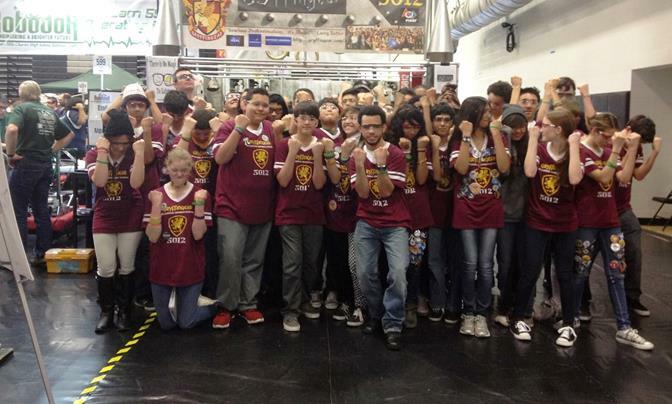 The TPAA team, known as Team 5012 Gryffngear, was one of 41 teams taking part in the US FIRST FRC Inland Empire Regional Feb. 28 to March 2. The team came home with the “Rookie All Star Award,” recognizing the best first-year team, and also won the Safety Award for keeping a safe and secure working environment. The robotics teams had six weeks to build a robot to compete in this year’s game, “Aerial Assist.” The robot must pick up and pass large exercise balls, as well as construct autonomous programming to perform unique design challenges. The Rookie All Star Award from US FIRST.ORG is an award based on much more than Robotics; it is an award given to teams who embrace the FIRST philosophy of spreading STEM Education in their communities, and reaching out in other ways that build community through marketing, and service. The award is an honor presented to only one rookie team per regional, and qualifies the team for the world championships in St. Louis in April. Next up for TPAA is the Las Vegas Regional, April 3-5, followed by the trip to St. Louis in late April. Team sponsors include Northrop Grumman, Lockheed Martin, Choices in Learning, and the Aero-Institute of NASA.